A joint meeting of the Co-ordination Committee of Muttahida Quami Movement (MQM) was held in London and Pakistan. The meeting discussed in detail the invitation extended by the Tehreek-i-Minhaj-ul-Quran for participating in its long march being held in Islamabad on 14th January for introducing revolutionary reforms in the electoral system of the country and for eliminating the feudal system and corruption from the country. 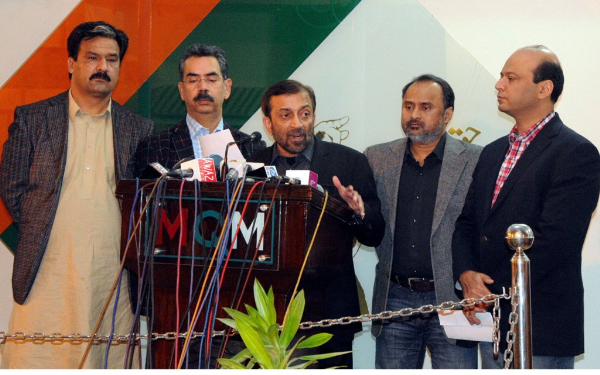 This was stated by the Deputy Convener of the Co-ordination Committee Dr Farooq Sattar in a press briefing at Nine Zero. Mr Altaf Hussain has endorsed the decision of the Co-ordination Committee and appealed to the MQM workers and haq parast people to participate in the long march on the 14th January in Islamabad. Other members of the Co-ordination Committee present at the briefing included Saleem Shahzad, Waseem Aftab, Wasay Jalil and Gulfaraz Khan Khattak.